Stem cells are usually associated with repairing damaged tissue and treating degenerative diseases, but they also have a unique property that may be harnessed to fight cancer. When injected into the body, stem cells naturally migrate to tumours, and can therefore be used as a vehicle to deliver cancer-killing drugs, genes or proteins. Dr. Ian Lorimer and his team are applying this technique to brain cancer using a protein called PTEN. This tumour-suppressing protein is often lost in brain cancer cells. 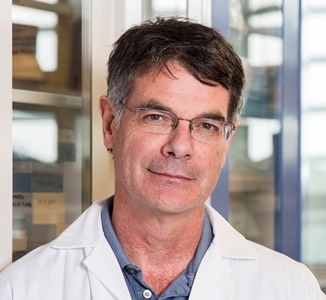 Dr. Lorimer and his team created neural stem cells that make a new version of PTEN, which is secreted and taken up by neighbouring brain cancer cells. Pilot lab experiments suggest that this new PTEN is active in brain cancer cells and can block their cancerous properties. This approach is particularly promising because patient-specific neural stem cells could integrate into the tumour and deliver the therapy continuously. See Molecular Therapy Methods & Clinical Development for details. Authors: Lavictoire SJ, Gont A, Julian LM, Stanford WL, Vlasschaert C, Gray DA, Jomaa D, Lorimer IAJ. Funders: Dr. Lorimer’s research is possible because of generous donations to cancer research at The Ottawa Hospital. This project was also supported by the Canadian Institutes of Health Research, the Heart and Stroke Foundation Canadian Partnership for Stroke Recovery, the Ontario Ministry of Economic Development, Job Creation and Trade, the Ontario Institute for Regenerative Medicine and the Ottawa Regional Cancer Foundation. Dr. Lorimer holds the J. Adrien & Eileen Leger Chair in Cancer Research at The Ottawa Hospital.